Winter Indoor Instruction is OPEN until February 22, 2019. 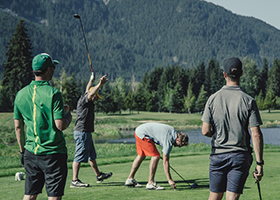 Practice all Winter and be ready to play by May at Nicklaus North, Whistler’s only indoor golf facility! Director of Instruction Graham Kehoe and Director of Golf Andrew Smart offer Whistler's only winter golf instruction, practice area, and club fitting center, all at the clubhouse at Nicklaus North. Utilizing Flightscope X3 technology and a 16' hitting bay with ball flight projected on a full size screen, the team at Nicklaus North offers Golf Instruction with PGA Professionals, as well as opportunity to work on your game during the winter months. Full golf club fitting systems from TaylorMade and Ping will be available during the winter, as well as an indoor putting green to develop the skills necessary to be ready for golf in the spring, or in the desert. Open late October through late February; Monday to Friday, 10am to 4pm. Evenings and weekends by request. Reservations required. All prices are subject to applicable taxes. Based on availability. Pricing is for 2018/19 winter season.